ARCH OF MEDINACELI. MEDIANCELI, ARCH AND ROMAN MOSAICS, ISBN: 978-84-609-5325-8, PVP: 27 euros. 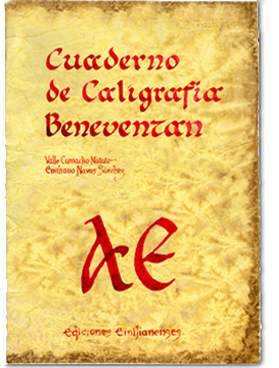 BENEVENTAN CALLIGRAPHY WORKBOOK, ISBN: 978-84-937178-3-4, PVP: 9 euros. BESTIARY OF THE CODEX ALBELDENSE, ISBN: 978-84-612-5239-8, PVP: 30 euros. CAMINO DE SANTIAGO. 819 Km. ISBN: 978-84-937178-7-2, PVP: 4 euros. CAPITALIS QUADRATA. TIPOGRAFÍA DE 23 LETRAS. PVP: 200 euros. 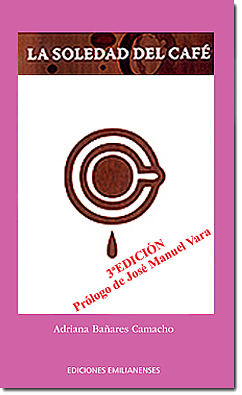 CAPITULAR LETTERS FOM CODEX 46, ISBN: 978-84-612-5241-1, PVP: 15 euros. COMPLETE ALPHABET OF CODEX 46, ISBN: 978-84-612-5240-4, PVP: 30 euros. 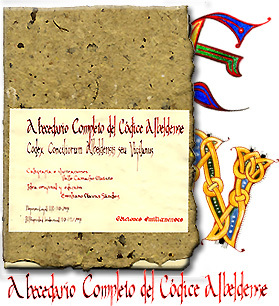 COMPLETE ALPHABET OF CODEX ALBELDENSE, ISBN: 978-84-612-5528-3, PVP: 30 euros. COUNT TELLO AND SAN MILLÁN ISBN:978-84-611-3345-1, PVP: 20 euros. 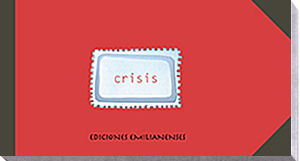 CRISIS, ISBN: 978-84-937178-6-5, PVP: 12 euros. 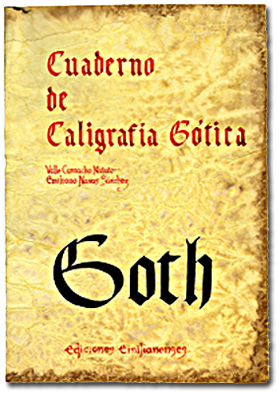 GOTHIC CALLIGRAPHY WORKBOOK, ISBN: 978-84-937178-4-1, PVP: 9 euros. IN SITU. WATERCOLOR-HAIKUS. ISBN: 978-84-612-5238-1, PVP: 30 euros. IVORY FROM SAN MILLAN, ISBN: 978-84-612-6028-7 , PVP: 35 euros. 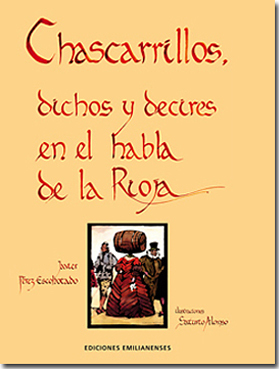 JOKES, SAYINGS, AND MAXIMS IN THE LANGUAGE OF LA RIOJA, ISBN: 978-84-612-3502-5, PVP: 20 euros. LOGRONO, AN ILLUSTRATED HISTORY OF THE CITY, ISBN: 978-84-609-1979-7, PVP:20 euros. MEDIEVAL COPYISTS, ISBN: 978-84-612-5242-8, PVP: 20 euros. 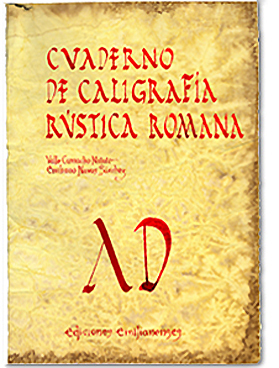 RUSTIC ROMAN CALLIGRAPHY WORKBOOK, ISBN: 978-84-937178-5-8, PVP: 9 euros. SANTIAGO THE SORCERER AND FIVE MORE TALES, ISBN: 978-84-609-9377-3, PVP: 19 euros. 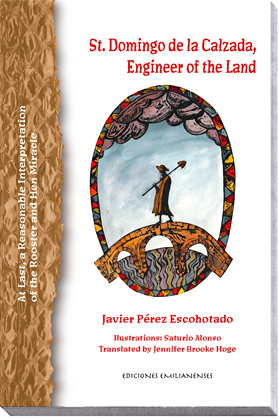 St. DOMINGO DE LA CALZADA, ENGINEER OF THE LAND, ISBN: 978-84-937178-1-0, PVP: 20 euros. STORYVILLE, ISBN: 978-84-612-2708-2, PVP: 22 euros. THE ORIGINS OF SPANISH LANGUAGE EXPLAINED TO CHILDRENS, ISBN: 978-84-607-5440-4, PVP: 30 euros. THE SOLITUDE OF COFEE ISBN: 978-84-609-7290-7, PVP: 15 euros. UNCIAL CALLIGRAPHY WORKBOOK, ISBN:978-84-937178-2-7, PVP: 9 euros. This illustrated book by Virginia Pedrero Boceta and F. J. Rico Lombardo, both secondary school teachers, is a creative and visual contribution that places the CRISIS in its context and aspires to be used as an educational tool so that young people are capable of absorbing concepts lost in the over-information that surrounds us. "CRISIS" is a reflection on this great contradiction: the hyper-consumption of some and the extreme poverty of others (the majority.) This contradiction reveals the crude reality of how the Western crisis has not brought about even the most minimal reflection on our economic system, a system whose fundamental pilar is constant and perpetual growth of production and consumption, without taking into account environmental impact or the shortages experienced by the rest of the world. St. Domingo de la Calzada, Engineer of the Land. This biographical essay about St. Domingo de la Calzada that curious and devoted readers are holding in their hands clarifies some historical contributions to the life and miracles of this saint, constructor of bridges and roads, and driving force behind other civil works all along the Way of St. James. Additionally, the author proposes a new interpretation of the rooster and hen wonder based on books of entertainment and debased alchemy. And, he presents how several great authors have included the miracle in their writing. The book is illustrated by Saturio Alonso, with colourful images of the saint, of the rooster and his vicissitudes in life. Mr. Alonso is a sculptor with broad experience in graphical design and painting who is living in Ireland from the eighties. During his professional stage in Spain, it was a component of the group El Cubri. He is a founder member of Artcore, counselor of KCAT, in Callan, county of Kilkenny. Valle Camacho Matute and Emiliano Navas Sánchez present a reproduction of the ivory from the coffer of San Millán, housed at the Monastery of Yuso in La Rioja. The illustrations -faithful to ivory coffer and rigorously detailed- are accompanied by texts that explain scenes from the life of St. Millán, also known as Emiliano. The text is written in calligraphy, is translated into Spanish, and respects the style of the artist who inscribed the ivory in Latin. With regard to the missing ivories, included is a description of them by Prudencio de Sandoval from 1601. -also known as actuarial script- from the Roman Empire (1st to 6th century AD). The workbook is handwritten in multicolored India ink, presenting the alphabet and several word exercises to practice each letter. 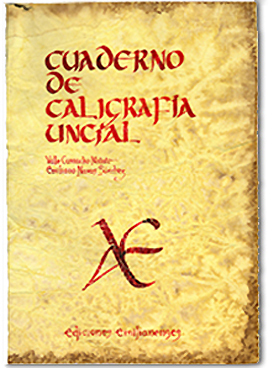 Valle Camacho Matute and Emiliano Navas Sánchez present this eminently practical workbook for learning and practicing uncial calligraphy (3rd to 10th century AD), monastic script par excellance. The text is handwritten in multicolored India ink with a metal calligraphy quill. The workbook is handwritten in India ink, presenting the alphabet in capital and lower case letters with several word exercises to practice Beneventan -also known as Longobarda- script. Learner's workbook for practicing Gothic Textualis Quadrata (13th to 16th century). The workbook is handwritten in India ink, presenting the alphabet in capital and lower case letters with several word exercises to practice Gothic script. Way of St. James. 819 Km. measured the French route of the walk. In this amended and improved second edition, Javier Pérez Escohotado presents an entertaining and rigorous analysis of several popular expressions from La Rioja. The illustrations are by the brilliant Spanish- Irish sculptor and graphic artist Saturio Alonso, member of the collective El Cubrí in the Spain of the 1980s. This edition also has an educational aim and therefore an easy-to-understand, didactic glossary with definitions has been added, not extent of complicity, that provides the key to some unusual terms and words used here with double meanings. 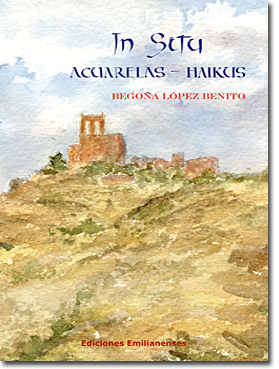 This art book is a generous invitation of the watercolorist Begoña López Benito. A woman petite and silent enough to take a landscape by surprise, she traps the moment with her brushes in Los Cameros, Valvanera, Islallana, in the no longer existing vegetable patches in Madre de Dios, and in Madrid's Retiro Park. The book is made up of eighty watercolors and their respective haikus which share with watercolor a lack of artifice, an immediacy, and vitality. Begoña writes how she paints, with a sharp sensibility that survives in her writing. And with synesthesia and metaphor, she finds new shades to add to her palette. Playing with the haiku, she is able to transport us with sincerity and delicacy to the moment each watercolor was created. Is an existence possible that is distanced from the creative process? From this taking-off point, Adriana Bañares has the generous courage to emotionally strip down and reveal what is inside her head, devoid of any type of papier mâché artifice with which others dress up their personalities to create biographies based on self-deception. Adriana delights us with an emotional striptease where we play the part of privileged confidants of her existential doubts and fears. This is an extreme act of vital and literary sincerity, worthy of respect and appreciation during these times of spiritual and economic crisis. Complete alphabet with 23 Capitalis quadrata letters handwritten in calligraphy by Valle Camacho Matute. 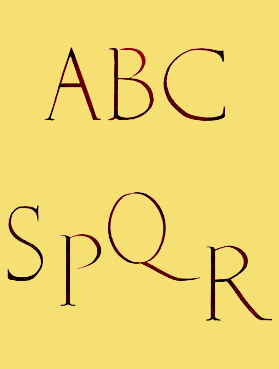 This is a Capitalis quadrata typography based on Roman Monumental script. A great resource for the creation of texts in historical recreations of the Roman era. Storyville is a fabulous place in the forest, very close to the Monastery of San Millán de la Cogolla, where goblins write the best stories in the codices. 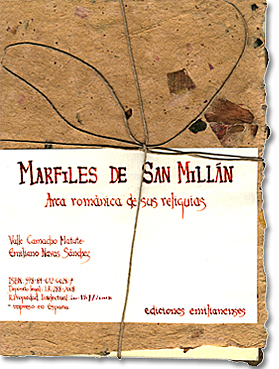 The authors invite children to discover how old books -codices- were made, and enjoy nature in five emblematic places: San Millán de la Cogolla, Mansilla, Valdezcaray, Enciso, and Ortigosa de Cameros. This is a file with 23 illustrations that reproduce the beautiful miniatures of the fanciful animals from the Codex Albendense or Vigilanus. Serpents, dragons, crocodiles, fantastic mermaids, asps, and imaginary deer give us the possibility of admiring this jewel of Riojan miniature. 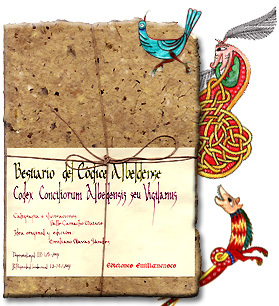 The copy of the Codex Albeldense or Vigilanus was completed in the year 976 in the scriptorium of the Monastery of San Martín de Albelda (La Rioja) by the copyist Vigilanus and his collaborators Sarrancino and García. This is a file with 25 illustrations that reproduce the initial letters of paragraphs from the Codex Albeldensis or Vigilanus, nine Hindu-Arabic numbers written from right to left -and appearing for the first time in this codex- and a self-portrait of the copyist Vigila. Rarely can one come across an archeological book such as this one that is so accessible for people passionate about archeology and non-professionals. Illustrated with photographs and watercolor, the book covers the origin, construction, and inscription of the Roman arch in Medinaceli, the only Roman arch with three gates in Spain. Because of the clarity of the text and the impressive illustrations, this book is perfect for high school students as well as anyone wanting to learn about the Roman monuments of Medinaceli. This children's book, illustrated with a variety of techniques, presents six stories for young readers. The musicality of the texts and the strength of the illustrations allow you to join the authors in discovering imaginary worlds. 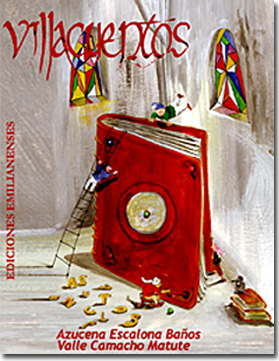 This inaugurates the collection of illustrated children's literature Chiguitos, a collection defined by Riojan vocabulary that will include proposals that combine art and children's literature, providing children with basic motivation for reading.. 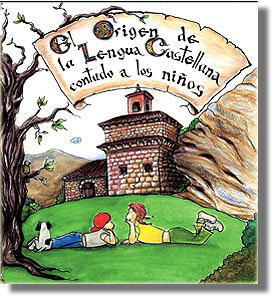 This is an attractive children's book that aims to promote knowledge about the origins of the first words written in Romance and Basque at the Monastery of San Millán de Suso, La Rioja. Because of its format, the book is directed towards elementary school students and their parents who want to share reading with their children. COMPLETE ALPHABET OF CODEX 46. 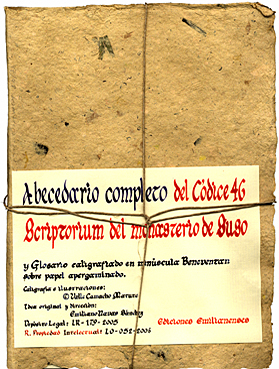 This file that contains the beautiful 23 capitular letters of Codex 46, written in the scriptorium of the Monastery of Suso in San Millán de la Cogolla, La Rioja and faithfully rendered by the illustrator Valle Camacho. Capitular Letter from Codex 46. 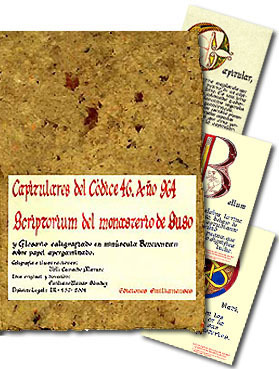 This file contains eight beautiful capitular letters from Codex 46, written in the scriptorium of the Monastery of Suso in San Millán de la Cogolla, La Rioja, and faithfully rendered by the illustrator Valle Camacho. This file presents copyists in a number of different postures as well as copyist lecterns from a variety of periods in history. It also includes a self-portrait of the copyist Vigila, originally represented in the Codex Albendensis. 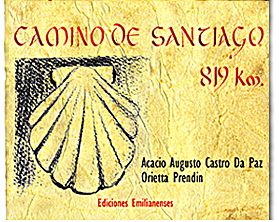 This book recovers a traditional Riojan legend written by the Piarist José Beltrán in Logroño in 1934. 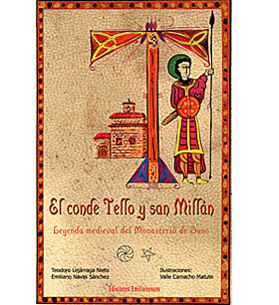 It includes a study of the miniatures and graffiti that represent the warrior Tello on the walls of the interior portico at the Monastery of Suso as well as in several codices, including the Liber Commicus (1073) and the Spanish Bible of Florencio and Sancho from the year 960. Briones is a village in La Rioja declared a Historic-Artistic Site because of its medieval urban planning and the conservation of several buildings constructed with ashlar masonry. 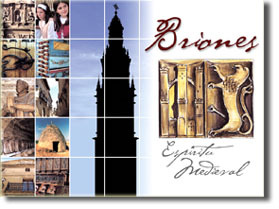 Located in a privileged enclave in the basin of the Ebro River, close to Haro, Briones has excellent historical and cultural surprises like the Jornadas Medievales (Medieval Forum) celebrated in mid-June and the Museum of Wine Culture, the most important in the world which was created by the Dinastía Vivanco Foundation. 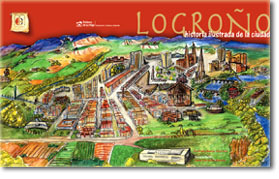 This is an illustrated book with an emphasis on visual language, representing a selection of historical information about the city of Logroño since its origins in 1861, the year when its wall was demolished. The drawings and watercolor illustrations play a major role in depicting everyday and heretofore unknown aspects of the city. The text targets young people and adults with a graphic, didactic, and appealing approach.